Miracle Adventure © 1993 Data East Corp. Miracle Adventure was released on December 16, 1993 in Japan. This game is known outside Japan as 'Spinmaster'. 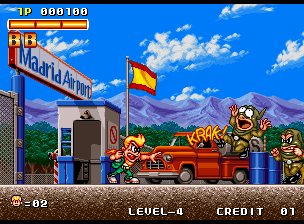 Miracle Adventure is Data East's first game developed and released for the SNK Neo-Geo MVS hardware. This game seems heavily inspired by Data East's classic game "Caveman Ninja" (the artwork style, some character's animations, as well as the weapon's power up styles are a little too similar!). The Mad Doctor also appeared as the final boss in Data East's "Tumble Pop". Pony Canyon / Scitron released a limited-edition soundtrack album for this game (Miracle Adventure. Tatakae Genshijin 3 - PCCB-00146) on February 18, 1994.